Karen Mariluch from Glendale, Arizona adopted a Pomeranian named King nine years ago to help her cope with the death of her husband. Last week, King saved her life when he alerted her to a fire that had broken out in the residential portion of her formal wear business while she was sleeping. Fire officials also credit King as a hero for waking Mariluch, 71, who takes sleeping pills and may not have woken up in time had it not been for King. “He was scratching on my face, which he never does and then nudging my head up…trying to get me up,” she told Phoenix television station Fox 10. The fire was started by an unattended candle. Falling asleep is a factor in 11% percent of home candle fires and 43% of the associated deaths. Please review NFPA's safety information on candles. Lee-Bridges' latest speaking engagement was at the National Healthy Homes Conference this week in Nashville, Tennessee. Hosted by the U.S. Department of Housing and Urban Development, the event included exhibitors and more than 140 education sessions dedicated to improving America's homes. Smoke alarms were credited with saving four lives in Everett, WA, earlier this week. A woman and three children were able to safely escape their home upon hearing the smoke alarms sound at around 5am. According to local news reports, the home appears to be a total loss; the cause of the fire is under investigation. For more information on the importance of smoke alarms, check out NFPA's smoke alarms safety tips. We recently debuted a new infographic on cooking fire safety and you all really seemed to find it helpful. So we put together another infographic highlighting smoke alarm safety information and statistics. Smoke alarms save lives. If there is a fire in your home, smoke spreads fast and you need smoke alarms to give you time to get out. Having a working smoke alarm cuts the chances of dying in a reported fire in half. Almost two-thirds of home fire deaths resulted from fires in homes with no smoke alarms or no working smoke alarms. Review this latest infographic and be sure to share with your friends and family as a good safety reminder! Take a look at our new site, Smoke Alarm Central for additional information on smoke alarms. !http://a2.typepad.com/6a0168e9101676970c01a73dcd87f2970d-200wi|src=http://a2.typepad.com/6a0168e9101676970c01a73dcd87f2970d-200wi|alt=Bruce Clarke|width=200|title=Bruce Clarke|class=asset asset-image at-xid-6a0168e9101676970c01a73dcd87f2970d img-responsive! Greetings and well wishes once again from the CFPS Board of Directors. 70 new certificants </span>added to the CFPS ranks since January 1, 2014.&#0160; The CFPS board joins me in extending congratulations and a warm welcome to our new certificants. You should all be very proud of this great achievement. The addition of these new certificants brings the total number of active CFPS holders to 2306. I know the required exam is not easy by any standards but I think that most of you will agree that earning the right to add the CFPS professional designation after your name is well worth the effort. !http://nfpa.typepad.com/.a/6a00d8351b9f3453ef01a73dcd89ad970d-120wi|src=http://nfpa.typepad.com/.a/6a00d8351b9f3453ef01a73dcd89ad970d-120wi|alt=CFPSbrochure|style=margin: 0px 5px 5px 0px;|title=CFPSbrochure|class=asset asset-image at-xid-6a00d8351b9f3453ef01a73dcd89ad970d img-responsive!I am very excited to witness both the positive direction the program has taken over the past several years as well as the excellent plan we are developing for the future. In addition to our plan for program growth with uncompromising integrity, a top priority of the Board will continue to be a focus on promotional visibility across our associated industries. We can all share in this program promotion though our daily professional conduct, activities, and a willingness to challenge colleagues to pursue a CFPS certification for themselves.&#0160; Nothing makes me more excited than to see industry job postings where holding the CFPS certification is recognized as a differentiator. I am even seeing more and more postings where “CFPS or equivalent” is a top requirement. This is a testimony to the increasing value of our program which certainly appears to be expanding in several fire protection and loss prevention related industries. While on the topic (and at the risk of making this sound like a CFPS sales pitch – and anyone who knows me knows I am not above promoting our program when I get the chance), I wanted to remind people that CFPS program brochures can be downloaded to share with colleagues. We just completed our annual Board of Directors elections for open positions where two past directors either chose not rot run again or could not run due to term limits. Congratulations to Dave Hague, David Ward, Frank Keisler, Jr., and Kevin Sluss on their recent election results. Voting proved we had another very tight election year with a slate of very talented individuals running for these open positions. Thanks so much to all who stepped up to participate in the election, both as candidates and voters. Looking ahead, I encourage all that were not elected (and anyone that has a CFPS and has the time and the interest in making the CFPS program even better), to run for a position on the Board of Directors next year. With elections and our 2013 ANSI recertification now behind us, the Board is focusing on our involvement in the upcoming NFPA Conference and Exposition in Las Vegas . For our part, there will be a CFPS booth, CFPS reception, and our CFPS annual meeting. If you are going to be in Las Vegas, please plan to attend our meeting and reception. Also, stop by the booth to say hello to the Board. In fact, send your non-CFPS colleagues by the booth to learn why they also should become certified! Details and locations of the various events have been posted on the CFPS LinkedIn&#0160;site. The approximately 4000 member CFPS LinkedIn site has great technical industry and CFPS program discussions. For those of you that are already part of the site, please post your stories where you have seen value in having the CFPS. I have enjoyed many of these reports and know many more people would love to hear them too. This is especially true since LinkedIn site membership is not only open to those that have a CFPS but also to those exploring the possibility of obtaining a CFPS.&#0160; Access the&#0160;CFPS LinkedIn site. On another note, as mentioned in our last update, CFPS recertification starts by navigating to nfpa.org/cfps and clicking on Enter CFPS Online services . This year we posted some updates and clarification on certification requirements so, I encourage you to make sure to plan ahead. From this site, you can also&#0160;access For CFPS certificate holders&#0160;to view important CFPS related documents including CFPS Board of Director contact information, the CFPS Bylaws, and the noted recertification requirements tables that were recently updated. On a final note, while my term as a Board member is not expiring for two more years, this will be my last communication as Board Chair. A new Chairman will be nominated from the existing 12 Board members in June. * I want to personally thank those that have served on the Board* but are moving off in June. Mr. Ray Lonabaugh has been a board member pretty much since the beginning and has served as a dedicated and instrumental part of outstanding program guidance for well over a decade. Mr. Chris Butts became one of our FPE Board members a few years back and immediately jumped in with great ideas and program involvement. A big thank you to both. There are also three NFPA staff members that constantly focus time going “above and beyond” for the betterment of the program, and those people are Ms. Beth Turner &#0160;(CFPS Program Administrator), Mr. John Cannon (Certification Program Manager) and Mr. Leon Katcharian (Director of Certification). They continue to make the CFPS (and strong CFPS-NFPA relationship) increasingly stronger. Thank you. employees and injured another 70 people. The Beverly Hills fire was the worst multiple-death building fire in the United States since the 1942 fire in Boston's Cocoanut Grove night club. For more information about this fire NFPA's Fire Investigations. To see NFPA's Fire Analysis and Research Division's statistical report Eating and Drinking Establishments. For documents in the Annual 2015 revision cycle that received public comments, links are now available to “View Public Comments” on each Next edition tab of the document information pages under the category “Second Draft”. You will be asked to sign-in or create a free online account with NFPA before using this system. Please note that the following four documents did not receive any public comments and, therefore, will not have a link available for viewing: NFPA 291, NFPA 312, NFPA 423, and NFPA 1071. NFPA and the United Kingdom’s Fire Protection Association (FPA) have now formalized their relationship with a Memoradum of Understanding (MOU) which emphasizes the use NFPA’s codes and standards in FPA’s Property Risk Management Education and Certification Program. FPA’s Property Risk Management Education and Certification Program will provide insurance risk engineers with technical knowledge needed to assess property risk from fire and natural hazards alongside key principles of loss potential estimation, business loss mitigation and business continuity. The MOU will serve as the framework of cooperation between FPA and NFPA through which NFPA codes and standards will be a significant part of the program’s curriculum. To help develop the program, FPA will use NFPA’s Fire Code and NFPA will provide select technical review of training materials. The FPA, in association with the fire protection community and insurers, have identified a need for common technical knowledge that helps insurance companies effectively assess property risk. NFPA is pleased to join FPA in its efforts to advance the qualifications of insurance professionals in Europe. This is a great opportunity to collaborate on a common goal – reducing property losses from fire and associated hazards. Firefighters in Vacaville, Calif. were shopping at a Costco over Memorial Day weekend for groceries. Before reaching the cashier, they received an emergency call and had to leave. Upon their return, they found the receipt shown above; an Air Force wife had paid for their $123.25 worth of groceries just to say thanks. Since they did not know who had done this, the firefighters took to their Facebook page to offer their thanks. The firefighters pay $25 each per shift for meals, but they said that they were not going to keep the money they saved that day. Instead, they want to pay it forward. So, when they encountered an elderly couple buying flowers for Memorial Day, they covered the bill; and, they said they're planning to host a 90-year-old World War II veteran for dinner soon. “Smoke detectors saved a life…” That was the lede in a local news story about a Fall River, MA, resident who called the fire department to report a fire in his home. According to The Herald News, the fire began on the second floor of a triple-decker home and extended to the third. No one was injured. Once again, this news story reinforces the life-saving value of working smoke alarms. NFPA statistics show that having a working smoke alarm cuts your chance of dying in a fire in half. So remember to test yours monthly and change the batteries once a year! At 8:23 p.m. on Tuesday, May 23, 1995, a four-alarm fire occurred in a bulk merchandising store in Quincy, MA. At the time of the fire the building was occupied by approximately 60 employees and 100 customers. The single story building was of noncombustible construction with an area of 122,395 square feet. The display merchandise and bulk storage was on a metal double rack system throughout the store. The building was equipped with a fire alarm and sprinkler system. The fire started in the lower storage rack of an area that stored pool chemicals. An investigation conducted by the Quincy Fire Department and the Massachusetts State Fire Marshal’s Office determined the fire was accidental in nature probably caused by a chemical reaction involving the pool chemicals and leaking motor oil. The motor oil leaked from boxes containing lawn mowers stored in the vicinity of the pool chemicals. The lawn mowers were shipped in containers that included a small quantity of oil which had to be added prior to use. Incompatible materials stored too close to oxidizers. Materials stored in excess of allowable storage heights and within 18 inches of the sprinklers. Inadequate sprinkler design for encapsulated materials. The lack of in-rack sprinklers. Rack shelving of solid materials and wooden slats spaced too close together. Storage in aisles, which reduced commodity clearance between adjacent racks. For more information about this fire NFPA's Fire Investigations. To see NFPA's Fire Analysis and Research Division's statistical report Stores and Other Mercantile Properties. The effectiveness of side-by-side burn demonstrations was evident in Colorado this month, when the Colorado Fire Sprinkler Coalition helped stage a public event that was highlighted by the media. Local TV stations caught the live demonstration involving two structures mimicking a living room—one equipped with sprinklers, one without—that were set on fire. These events showcase a sprinkler system’s rapidity in dousing flames and the devastating aftermath that could occur in homes without these systems. For dramatic footage from the event, visit NFPA's Fire Sprinkler Initiative blog. This past week, two fire incidents involved neighbors who took swift action upon hearing nearby smoke alarms. A man who slept through the smoke alarms sounding in his Nelson, UK, home, was rescued by residents who rushed to his aid. Meanwhile, neighbors who heard smoke alarms sounding in a flat in Poole, U.K., promptly contacted the local fire service. “On this occasion a neighbor was alerted by the sounding of the smoke alarm. 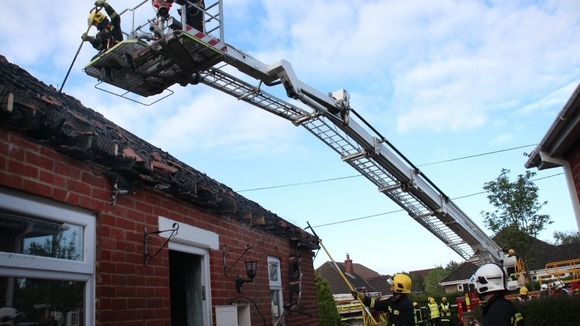 This incident could have been much worse and is a reminder of the importance of having working smoke alarms,” said a spokesman for the fire service. Both incidents involved unattended cooking fires. Of course, being fully prepared for a fire in your own home is the best safety plan of all. NFPA offers a wealth of information on smoke alarms and home escape planning, which can make a life-saving difference in a home fire. An ABC News segment with Diane Sawyer aired last night, discussing why, as summer approaches, we should 'raise the alarms' on home-fire hazards. NFPA contributed to this piece offering some of our statistics and information on home fires, including that over 75,000 home fires occur between May and August. Watch the above clip for detail on summer home fire hazards and how to avoid them. As many of you know, cooking is the leading cause of home fires and home fire injuries. This new infographic, developed by NFPA, highlights important cooking safety tips that can help reduce your risk of injuries. Take a look today and share it with your friends and family. Was it the first major terrorist attack on the United States by a foreign party? Some historians thinks so. In 1916, before the United States entered World War I, saboteurs loyal to Germany blew up more than two million pounds (907,185 kilograms) of ammunition stored at the Black Tom railroad yard in New Jersey to prevent it from being shiped overseas to Allied countries in Europe. Seven people died in the explosions, which lasted several hours and were felt as far as 90 miles (145 kilometers) away. For more on the story, read "Looking Back" in the May/June issue of NFPA Journal. As Memorial Day Weekend approaches kicking off the unofficial start of summer, backyard chefs everywhere are dusting off their grills, eager to spring into the long-awaited barbeque season. This summer, NFPA recommends that grillers pay particular attention to safety, especially in June and July, when home fires involving grilling fires occur most often. According to a 2013 NFPA report on cooking equipment fires, gas grills were involved in an annual average of 7,200 home fires in 2007-2011, while charcoal or other solid-fueled grills were responsible for an annual average of 1,400 home fires. Last year, Hannah Storm, ESPN SportsCenter anchor, was severely burned in a grill fire at her home. She has since worked with NFPA to record several videos to share her story and raise awareness for grilling safety in hopes that others will avoid similar incidents. Video: Hannah Storm, NFPA team up to offer consumers home fire safety. Read a complete list of specific safety tips and download an easy safety tip sheet for reference. For more highlights from Acton&#39;s presentation, visit NFPA's Fire Sprinkler Initiative blog. The 2014 NFPA Conference & Expo mobile app is available to download on your smart phone or tablet! The C&E app provides easy-to-use interactivity that will enhance your event experience. iPhone/iPod Touch/iPad and Android devices: Visit your favorite app store on your device and search for NFPA. All other mobile devices: While on your smartphone, point your mobile browser to http://m.core-apps.com/nfpa-14. From there you will be directed to download the proper version of the app for your particular device or bookmark the page for future reference. Who is NFPA's technical questions service for? How does it work? What can users expect? Those questions and more are answered by Ron Coté, principal life safety engineer at NFPA, in "Questions + Answers," the anchor piece of the "In Compliance" department in the new May/June issue of NFPA Journal. Coté typically handles topics related to NFPA 101, Life Safety Code, but in this issue he offers an informative overview of technical services, which allows members and authorities having jurisdiction to talk to NFPA technical staff about any NFPA code and standard. Also in "In Compliance," Matt Klaus looks at why proper commodity classification is essential for determining the proper sprinkler system in storage occupancies; Wayne Moore offers more reasons to know and use the most recent edition of NFPA 72, National Fire Alarm and Signaling Code; and Jeff Sargent writes about a simpler way to assess risk and determine the use of personal protective equipment using NFPA 70E, Electrical Safety in the Workplace. Tours will take place on July 8th and July 10th to accommodate NFPA 70E® and 2014 NEC® seminar attendees. Transportation to and from the stadium will be provided. Fire drills are an important part of a life safety and evacuation plan that should be practiced repeatedly in order for everyone to effectively respond to a real fire. Our first exposure to fire drills is typically conducted in the school setting. Both NFPA 101, Life Safety Code, and NFPA 5000, Building Construction and Safety Code, require both audible and visual signals in accordance with NFPA 72, National Fire Alarm and Signaling Code, and ICC/ANSIA117.1, American National Standard for Accessible and Usable Buildings and Facilities, in new and existing school facilities. The loud noise and flashing strobe light generated by the fire alarm system is intended to alert students and faculty. It has proven to be a useful tool in fire evacuation. For a person with ASD however, the sounds and bright lights may be a source of extreme unpleasantness, discomfort, seizures and confusion. No specific, scientific based literature looking at the response to fire alarms by people diagnosed with ASD was found. However, some general information is presented on sound and light sensitivities. In addition, some anecdotal information from first responders is included. Review the new literature summary through the Foundation website. However, solar panels on buildings present several challenges to firefighters. The NFPA recently published a report that was referenced throughout this article, on “Firefighter Safety and Emergency Response for Solar Power Systems,” authored by Casey Grant. Some of these challenges include electrical hazards, potential ignition source, inhibiting vertical ventilation, increased roof load that may not have been originally designed for the structure and more. Take a look at the article and the referenced report for more information on tackling these challenges to maintain firefighter safety. I t's new. It's exciting. It's NFPA 4! NFPA 4, Integrated Fire Protection and Life Safety System Testing, originally started life as the integrated system testing portion of NFPA 3, Recommended Practice on Commissioning and Integrated Testing of Fire Protection and Life Safety Systems. However, the Technical Committee on Commissioning and Integrated Testing decided to remove it from NFPA 3 and create an entirely new document that can be used for both new and existing buildings. For more information on this brand new standard, read Fred Durson's article "All Systems Go" in the May/June issue of NFPA Journal. A canine’s nose is a million times more sensitive than a human’s nose and can be trained to detect a wide variety of specific scents such as drugs, fruits, and explosives. Canines are trained to alert their handlers to the presence of these hazardous items by pawing, barking, or in the case of something dangerous, sitting or lying quietly. Additionally, canines are tremendously useful team members for sniffing out threats to homeland security, and the demand for top-notch canines is ever increasing. For explosives detection, canine training is especially critical, calling for the best training aids, tools and techniques. In this briefing, Don Roberts, Canine Explosives Detection Program Manager, will provide an overview of this program and describe its role in infrastructure protection and the Homeland Security Enterprise. !http://nfpa.typepad.com/.a/6a00d8351b9f3453ef01a511b8bbdd970c-450wi|src=http://nfpa.typepad.com/.a/6a00d8351b9f3453ef01a511b8bbdd970c-450wi|alt=Jim Shannon|style=width: 450px; display: block; margin-left: auto; margin-right: auto;|title=Jim Shannon|class=asset asset-image at-xid-6a00d8351b9f3453ef01a511b8bbdd970c img-responsive! Read more of Shannon&#39;s comments on NFPA's Fire Sprinkler Initiative website. Since the 1970s, the number of fire deaths in homes has fallen from roughly 6,000 annually to its current level of just under 2,500. That’s the good news. Less encouraging is the number of fire deaths we continue to see in homes with no smoke alarms or no working smoke alarms. That's the problem addressed by Lorraine Carli, vice-president of Advocacy and Outreach at NFPA, in "Cool Factor," the "Outreach" column in the new May/June issue of NFPA Journal. Among her solutions: increasing the number of working, listed smoke alarms in homes. "The sharp reduction in home fire deaths means that most people do not think they will suffer a home fire, much less lose a loved one to a fire," Carli writes. "But they still happen, and there are still too many people dying in home fires." On May 11, 1984, eight teenagers died in a fire at Six Flags Adventure Park in Jackson Township, New Jersey. The fire occurred in a popular attraction called the Haunted Castle, a series of darkened, winding passageways that contained a variety of displays—the rat lady, a hunchback, the spider room, and so on—designed to scare visitors. When the fire broke out, some visitors reportedly commented on how real the illusion seemed. The attraction was not sprinklered. In the tangled aftermath of the fire, which included a court case that generated national headlines, a central question was whether sprinklers would have saved the lives of the teens who perished. In "Haunted by Fire," a feature story in the new May/June issue of NFPA Journal, writer Kathleen Robinson offers a fascinating look back at the conflicting answers that were provided to that question three decades ago, and introduces us to a new research project that attempts to answer the question definitively using state-of-the-art computing power and the latest in fire modeling. The researchers featured in the story will present their results at the upcoming NFPA Conference & Expo in Las Vegas. Everyone loves a firefighter rescue story that ends happily, and we especially love this one that involves rescuing a dog. Firefighters with the Indianapolis Fire Department responsed to an apartment fire a couple of days ago. Someone originally reported that somebody was trapped inside. As it turned out, everyone had escaped safely, however during the search effort, a firefighter came across a 6 year old poodle that was barely conscious. The poodle was brought outside where paramedics administered oxygen and fluids through an IV. Within twenty minutes, the dog was moving and taken to a nearby animal hospital. IFD said the Project Breathe Mask they used with this dog, has been used by IFD since 2010 when Invisible Fence donated one to each IFD apparatus. The specialized mask is designed to specifically fit the snout of an animal. We are glad this story has a happy ending thanks to the first responders on the scene! Time and again, real-life news stories show us that working smoke alarms alert people to fire in time to safely escape. But when people have a home fire escape plan in place, the ability to use that time wisely is maximized. That was the case for a family in Hampshire, England, who experienced a fire in their home on Monday. According to a local news report, the family had working smoke alarms, a pre-planned escape route and closed all of their doors as part of their bedtime routine. To learn more about smoke alarms and creating a home fire escape plan, read NFPA's smoke alarm safety tips and our home escape planning section. Between two serious home fires that occurred over the past few days, smoke alarms saved the lives of 8 people. In Tampa, FL, smoke alarms alerted a family of seven to a fire that broke out in their home overnight. While all members – one adult and six children - were able to escape safely, the house was engulfed in flames when firefighters arrived at the scene. In Mono, ON, a man awoke to the sound of smoke alarms and safely escaped his home, which burned to the ground in the hours that followed. For more information about properly installing and maintaining smoke alarms, check out NFPA's smoke alarm safety tips sheet. NFPA launches new Learn Not to Burn Preschool Program: The program's behaviors and strategies are guided by research related to fire safety messaging and young children, including using positively framed messages, opportunities for active engagement and encouragement of family involvement. In the early evening hours on May 11, 1984, a rapidly spreading fire destroyed the "Haunted Castle" amusement facility at the 200-acre Six Flags Great Adventure Park in Jackson Township, New Jersey, approximately 50 mile south of New York City. At the time of the fire, there were an estimated 28-34 visitors and three employees in the Haunted Castle. Eight of the visitors, unable to immediately exit the structure, died in the fire. The one-story structure was comprised of 17 commercial trailers with approximate dimensions of 8 feet high by 8 feet wide and 40 feet long. The trailers were connected together by means of plywood and wood framing. The front facade of the structure consisted of a wall approximately 35 feet high by 109 feet long with three smaller portions that projected into the park area. The interior of the Haunted Castle was constructed of plywood partitions which created a convoluted path of travel approximately 450 feet in length. Materials used for the interior of the Haunted Castle included synthetic foam, various fabrics and plastics, plywood, and tar paper. For more information on this NFPA's Full Fire Investigation report. Go to NFPA Journal May/June 2014 Article Haunted by Fire. Today in fire history: a major fire in a toy factory kills 188. On May 10, 1993, a major fire occurred at the Kader Industrial (Thailand) Company, Ltd. factory in the Nakhon Pathom Province of Thailand. This facility manufactured stuffed toys, soft-plastic dolls and hard-plastic dolls. The fire cause was still under investigation. To date, 188 factory workers have died in this fire, although this number may increase because of the large number of workers who received serious injuries. In addition, the fire destroyed the complex's main structure and caused damage to a smaller secondary structure. Initial information indicates that the fire may have started near an electrical control panel in an area that was used for the storage of packaging and finished products. The security personnel and others unsuccessfully attempted to extinguish the fire. Approximately 1/2 hour after the fire was discovered, someone in the facility notified the fire department. Approximately nine minutes after notification fire fighters arrived and found a large portion of the building was heavily involved in fire. In addition most of the 1,100 employees in that portion of the building were still attempting to exit through a single exit stairway. Arriving fire fighters immediately encountered multiple major commitment for their first alarm companies. The fire fighters had to initiate suppression operations against a large and rapidly spreading fire. They had to immediately assist thousands of people who were trapped or directly exposed to the growing fire, and they had to manage the care of a large number of injured survivors. The most significant factor contributing to the large loss of life was inadequate exit provisions. However, other factors contributing to the loss include delay in fire department notification, inadequate training, lack of evacuation planning, the lack of vertical and horizontal fire separations, and the absence of automatic suppression and detection systems. For more information on this fire go to NFPA's Fire Investigations. As Arson Awareness Week comes to a close, I would like to take this opportunity to tell people about NFPA's report on intentional fires. Intentional Fires, by Richard Campbell, is an excellent resource and includes information on structure, vehicle and outside intentional fires, when and where these fires occur and arrest and clearance information. More than 280,000 intentionally set fires per year were reported to local fire departments in the U.S. between 2007-2011. Vehicle fires accounted for seven percent of intentional fires and fourteen percent of the direct property damage caused by intentional fires. I hope you can take a minute to check out the intentional fires report. A new report, "Evaluating Occupant Load Factors for Ambulatory Health Care Facilities" has just been published. The report was authored by Javier Cuesta and Daniel Alvear with the GIDAI Group at the University of Cantabria in Spain. The NFPA, 101 Life Safety Code, and NFPA 5000, Building Construction and Safety Code, apply the occupant load factor for business occupancies of 9.33 m2/person (100 feet2/person) to ambulatory health care facilities. It has been questioned whether this use is appropriate. As a result, we collected and analyzed data on ambulatory health care facilities in order to provide more information to the Technical Committee on Healthcare Occupancies of NFPA. Download the full report through the Fire Protection Research Foundation website. Anyone may submit a comment on these proposed TIAs by the June 20, 2014 closing date. Along with your comment, please identify the number of the TIA and forward to the Secretary, Standards Council by the closing date. What's new in the world of fire suppression and detection? Quite a lot, according to Kathleen Almand, NFPA's vice-president of Research and executive director of the Fire Protection Research Foundation. And some of it was discussed at the March 2014 Suppression, Detection, and Signaling Research and Applications Conference, better known as SupDet. Among the changes in the detection arena, NIST, UL, and the Foundation are looking at ways to enhance the performance of smoke alarms in the presence of nuisance sources. And the detection industry has developed technology that allows a more selective response to smoke and flames. For more on changes in the industry, read Almand’s column “Keeping Pace” in the May/June issue of NFPA Journal. Join our National Electrical Safety Month Twitter Chat co-hosted with Electrical Safety Foundation International (ESFI) on Wednesday, May 14th at 2:00 EDT! We'll be sharing tips and answering questions about preventing electrical fires, injuries and fatalities. You can submit your questions ahead of time through Facebook (by leaving a comment on our post), emailing info@esfi.org or in real time by using the hashtag #NESMChat. Register Today! This webinar will be offered on May 28, 2014 at 1:00 p.m. (EST) through Adobe Connect. If you are interested in attending this webinar, please contact Carolyn Cronin by email or by phone at 617-984-7240. You will then receive an Adobe Connect Meeting Notice invite with the appropriate log-in and dial-in information as the date approaches. In alignment with NFPA’s new online submission system and revised standards development process, attendees at this year's NFPA Technical Meeting (Tech Session) are now able to access a complete electronic version of the Tech Session Agenda and First and Second Draft Reports of the NFPA Standards that will be addressed at the Tech Session. Since this year’s Tech Session will address standards that have been processed through the revised standards development process, you are encouraged to attend the Standards Forum on Tuesday, June 10 at 1:30 p.m., where the new Tech Session process will be reviewed. NFPA will be providing wireless internet access during the Tech Session so attendees have the option of downloading the agenda prior to or during the Tech Session at: http://www.nfpa.org/techsession. Other documentation such as First Draft Reports and Second Draft Reports can be viewed on the Next edition tab of each specific document information page. The links for the 12 specific NFPA Standards are listed below for your convenience. The Tech Session is an important step in developing a complete record to assist the Standards Council in determining the degree of consensus achieved on proposed changes to NFPA documents. During this meeting, NFPA members are given an opportunity to vote on proposed changes and members of the public can voice their opinions on these actions. The 2014 Tech Session will held on June 11-12 at the Mandalay Bay Convention Center in Las Vegas. Only NFPA members of record as of December 13, 2013 who are currently in good standing are eligible to vote. Wednesday, June 11, starting at 2:00 p.m.
Thursday, June 12, starting at 8:00 a.m.
"We’re called on to help everyone else—we aren’t the ones who should need the help." Or so the thinking of many first responders goes. But some emergency response personnel do need help, and many aren't getting it. According to Janet Wilmoth, author of the recent NFPA Journal article "Trouble in Mind," suicides among U.S. first responders have focused increased attention on behavioral health problems, such as alcoholism, drug abuse, depression, and post-traumatic stress disorder (PTSD), affecting primarily firefighters and emergency medical service (EMS) personnel. While data on the problem is scarce, she says, there are suggestions that such problems among emergency responders may be widespread. And adding to the problem is a lingering stigma that can make it difficult for emergency responders to acknowledge behavioral issues such as depression, either their own or that of a colleague. Faced with the growing awareness of the problem, a number of organizations are making efforts to provide emergency responders with tools to fight it. For example, the International Association of Fire Fighters and the International Association of Fire Chiefs will issue new, broader recommendations on behavioral health this summer, including suicide prevention and awareness, part of the Fire Service Joint Labor Management Wellness-Fitness Initiative launched in 1996. For more on this subject and the efforts being made to combat it, read Wilmoth's article in the May/June issue of NFPA Journal. A rapidly spreading wildfire swept across 5,916 acres of a wildland/urban interface area near Grayling, Michigan beginning around 3:50 PM on May 8, 1990. More than 76 homes and 125 other structures, plus 37 vehicles and boats, were destroyed or heavily damaged during the approximately five hours in which the wind pushed the Stephan Bridge Road fire for a distance of more than eight miles. Losses from the fire have been estimated at $5.5 million, plus another $700,000 in destroyed timber. Extinguishment costs were more than $56,000. Due to a number of circumstances, 131 structures within the fire perimeter or immediately adjacent to it survived the fire. The fire originated from the controlled burning of a large pile of brush and timber accumulated from recently cleared land. A burning permit was issued for the controlled burn and the burning was begun while snow covered the ground. It was later assumed that the pile was completely extinguished. However, investigators determined that the remaining fuel in the pile rekindled seven weeks after that initial ignition and escaped undetected from the cleared area. The resulting fire spread to other nearby ground fuels and extended into the adjacent forest before being detected by a Michigan Department of Natural Resources (DNR) aircraft pilot and observer. Based on NFPA’s analysis of this incident, the following are significant factors affecting the outcome of this fire, each is followed by specific recommendation(s) on how they might be mitigated. Whether you are in marketing, engineering, human resources or research, NFPA has a great career opportunity for you! We have a passion for protecting people and saving lives here at NFPA, so if you are looking to make a difference, consider working with us! Many various positions are now available in the Quincy, MA headquarters. Take a look at the list below and click on each job for a detailed description of job requirements and responsibilities. Learn more about careers at NFPA and apply for a position today! ESFI is continuing its annual effort to reach as many houses (and workplaces too!) as possible, and it has a very notable one to add to that list. This year, National Electrical Safety Month is being observed by the White House! In the first-ever Presidential Message of recognition for National Electrical Safety Month, President Obama emphasized the importance of educating the public about the importance of electrical safety. The Presidential Message was sponsored by the Consumer Product Safety Commission. The full text of the message can be found on ESFI’s website. For more information about National Electrical Safety Month, visit www.esfi.org. A new study conducted by the Cintas Corporation has revealed that more than half (55 percent) of adults have never used or received training on the proper operation of a fire extinguisher. “Our survey findings suggest that this is a real issue unless more people receive proper training on how to use a fire extinguisher,” says Tommy Thompson, Vice President of Cintas Fire Protection, a corporation dedicated to providing specialized services to businesses of all types throughout the country. “Whether you’re at home or at work, knowing how to properly operate a fire extinguisher can mean the difference between life and death.” A fire extinguisher is a crucial tool in fire prevention, often used to cease the spread of fire before it reaches dangerous levels in a variety of environments. Unlike some fire prevention tools, fire extinguishers are readily available and sold commercially throughout the country. Improper use of a fire extinguisher can potentially make a fire much worse, allowing it to spread and cause more damage. Thankfully, NFPA has assembled a comprehensive list of safety tips and instructions surrounding fire extinguishers that can help you learn the proper techniques and necessary safety precautions you should take when using an extinguisher. NFPA urges you to use portable fire extinguishers only when the fire is confined to a small area, such as a wastebasket, and is not growing; everyone has exited the building; the fire department has been called or is being called; and the room is not filled with smoke. Be sure to check out NFPA’s fire extinguisher information so you’re better prepared! Think your fire department is too big to use NFPA standards? Think again, says Ken Willette, division manager of NFPA's Public Fire Protection Division, in his column "Never Too Big" in the May/June issue of NFPA Journal. According to Willette, NFPA standards are now so ingrained in the daily operations of the nation’s fire service that many firefighters aren’t even aware of the role they play in their departments. For example, NFPA-compliant PPE and SCBA are now the norm. In less than one week, four early morning home fires occurred between 2:00 and 5:45 a.m., causing significant damage to two homes in Massachusetts and one in Michigan, and limited damage to a home in Brantford, Ontario. In each incident, working smoke alarms awoke the occupants to fire and enabled them to escape safely. The Boston Globe reported that firefighters in Newton, MA, responded to a three-alarm fire causing heavy smoke and water damage. The home’s central alarm system awoke all occupants in time for them to escape unharmed. “Branch County had a ‘smoke detectors save lives’ story happen overnight.” That was the lede in a Quincy Township, MI, news story (WTVB) about a father and his teenage son who escaped a fire that began in the home’s utility room. A two-alarm fire caused “heavy damage” to a home in Pelham, MA, according to The Lowell Sun, while the homeowner was awakened by working smoke alarms and was able to escape safely. Two adults and three children were able to safely escape a fire in their Brantford, ON, home due to working smoke alarms. “… if not for the working smoke alarm, we could have been investigating a fatal fire instead of one with limited property damage,” said a fire prevention officer with the Brantford Fire Department. NFPA's home fire statistics show that half of all home fire deaths occur between 11:00 p.m. and 7:00 a.m. These four stories underscore the life-saving value of smoke alarms when people are sleeping. We all remember the headlines: "Bangladesh Factory Collapse Death Toll Reaches 1,024." "Scores Die as Factory for Clothing Stores Collapses." "It Crumbles Like a Pack of Cards." Last year's collapse of a clothing factory at the Rana Plaza on the outskirts of Dhaka, the capital of Bangladesh, sparked international outrage. How many more people would have to die before the country took meaningful steps toward workplace safety? In fact, those steps had already begun, says Randolph W. Tucker, associate principal for fire protection/life safety for ccrd, a Houston-based engineering firm with more than 30 years' experience in healthcare, science and technology, critical facilities, and commissioning. Global retailer Gap Inc., alarmed by the deadly incidents that continued to occur in Bangladesh, had decided to push for safer workplaces among the factories it used to make its clothing—and that's where Tucker came in. To see how Tucker and his colleagues began to tackle the enormous task of improving fire and life safety in Bangladesh’s garment industry, read "Progress Up Close" in the May/June issue of NFPA Journal. If you're going to build something in Vegas, it's got to be amazing, and it is. The brand new High Roller, an observation wheel—read Ferris wheel—built by Caesars Entertainment to anchor The Linq, a new $550 million open-air pedestrian mall on the Strip, is not just any giant wheel. At 550 feet (168 meters), it’s the world’s tallest, with 28 enclosed cabins, each holding 40 guests, that turns at a pace of just under 1 foot (0.3 meters) per second, or about 30 minutes for a complete revolution. For the full story on how the design team developed the life safety features protecting the occupants of the High Roller, read Cate Weeks article "Big Wheel" in the May/June issue of NFPA Journal. Calling all NFPA LinkedIn group members! As a thank you for being active members of our community, we will be holding a networking breakfast on Wednesday, June 11th from 7:00-8:00am during NFPA Conference & Expo. If you are attending this year's Conference, we hope to see you then! No need to register for this event, but feel free to let us know if you plan to attend in the comment section below. We will be holding this event in the press room on the Expo floor. So, if you have always wanted to meet some of your fellow discussion group members in person, stop by for a free cup of coffee, a muffin, and lots of great networking! Not a member yet, but want to attend? Join our LinkedIn discussion group today! The Standards Forum is a dynamic, interactive session for technical committee members and all interested parties to discuss topics associated with the NFPA’s Standards Development Process. This year's Standards Forum will be held on June 10, 2014, from 1:30 p.m. until 5:30 p.m. and will be led by Christian Dubay, Chief Engineer and Vice President of NFPA Codes & Standards, who will provide an overview of enhancements to the electronic submission system; updates to the Regulations Governing the Development of NFPA Standards (Regs) and what to expect at this year’s NFPA Technical Meeting (Tech Session). In addition to discussions and an open Q&A forum, Maureen Brodoff, NFPA's General Counsel, will speak on Legal topics; Kerry Bell, Chair of the NFPA Standards Council, and Dawn Bellis, Council Secretary, will highlight and update attendees on Standards Council activities. As part of its Electric Vehicle Safety Training project , NFPA is working with automobile manufacturers to help prepare the nation's fire service and other first responders for the growing number of electric vehicles on the road. Free first responder guides for the following vehicles have just been added to NFPA's web site. We have just launched a fun, interactive quiz, which reinforces the training messages behind this year’s International Fire/EMS Safety and Health Week (June 15-21) theme, "Train Like You Fight". The International Association of Fire Chiefs (IAFC) and the National Volunteer Fire Council (NFVC) are co-sponsoring this quiz and sweepstakes with NFPA. Career firefighters, volunteer firefighters and other fire department employees and fire service members are invited to take the online, interactive quiz, featuring 15 questions related to firefighter health and safety. The quiz will be offered from May 5th through June 12th, 2014 through www.nfpa.org/fireservicequiz or through the contest tab on NFPA's Facebook page. One sweepstakes entry will be given for a completed quiz through the Snapapp widget - regardless of score achieved. On June 16th, 200 randomly selected winners will be announced. These winners will each receive a specially designed challenge coin commemorating this year’s International Fire/EMS Safety and Health Week. Read the full contest rules. Tragically, the fire also claimed the life of Binland Lee, a 22-year-old Boston University student weeks away from graduation. The Foundation recently completed a Phase 1 project related to characterizing nuisance sources for home smoke alarms. A report for this project is available on the Foundation's website. The Phase 1 effort included a literature review on the topic, a gap analysis, and recommendations to fill the gaps. The Phase 2 effort includes testing that would fill some of the knowledge gaps around nuisance sources related to both cooking and other types of nuisances, specifically steam. An RFP has been issued for the Phase 2 project with proposals due on Friday, May 9th. A major after-business-hours, high-rise office building fire occurred on Wednesday, May 4, 1988 in the city of Los Angeles, California, resulting in one fatality and ultimately destroying four floors of the First Interstate Bank Building. The 62-story, fire-resistive building is located in the heart of the city's business district. The Los Angeles City Fire Department described the suppression effort as the most challenging and difficult high-rise fire in the city's history. It took a total of 64 companies and 338 fire fighters more than 3 1/2 hours to control the fire. The fire is of great technical significance because of the interior and exterior fire spread, the significant internal smoke spread, and the role of modern office environment materials and their arrangement in relation to fire growth and development. The power of smoke alarms strikes again: A couple safely escaped a destructive home fire when they heard their smoke alarm sound, encountering smoke and fire as they proceeded downstairs. The fire began just before midnight on April 30, causing an estimated $600,000 in damage. 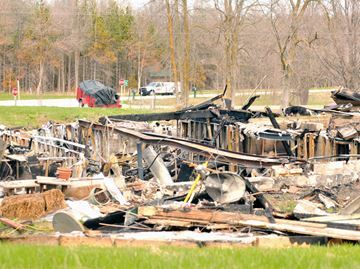 Located in Clearview, Ontario, the house was fully engulfed in flames when the local fire department arrived. Upon checking the air quality of nearby homes after the fire, the fire department discovered that some didn’t have smoke alarms. Instead of issuing fines, fire crews installed new ones. Visit CTV Barrie News to watch the full story. To learn more about proper installation and maintenance of smoke alarms, check out NFPA's smoke alarm safety tips. Solutions; Dhiren Chauhan, Fire and EMS Marketing Manager, Motorola Solutions; and Bill Jenaway, President, CFSI. The Congressional Fire Services Institute's (CFSI) Board of Directors selected James M. Shannon, President of NFPA, as the recipient of the 2014 CFSI/Motorola Solutions Mason Lankford Fire Service Leadership Award. The presentation of this award took place at the 26th Annual National Fire and Emergency Services Dinner on May 1 in Washington, D.C. Established in 1998 and co-sponsored by CFSI and Motorola Solutions, the award recognizes individuals who have been proactive at the local, state and federal government levels to improve and advance fire/emergency services and life safety issues. Representing a cross section of the fire and emergency services, previous recipients include chiefs, instructors, career and volunteer leaders and public safety advocates. A former member of Congress and Attorney General for the Commonwealth of Massachusetts, Mr. Shannon has served as NFPA president for the past 12 years. In June, he will retire from this position following a remarkable 23-year career with NFPA. Under Mr. Shannon's leadership, NFPA has made many significant contributions to the fire service at the federal level, helping raise greater awareness in Congress about the challenges and needs of our local first responders. In 2002, NFPA conducted a study in conjunction with the Federal Emergency Management Agency to assess the needs of our nation's fire and emergency services. The study, "A Needs Assessment of the U.S. Fire Service", was used extensively by the major fire service organizations on Capitol Hill in meetings and in testimony to advocate for support of federal legislation and programs that benefited the fire service. Two subsequent studies were also conducted by NFPA under Mr. Shannon's leadership, further justifying the need for federal support of our nation's fire and emergency services. Mr. Shannon has also been a tireless advocate for the fire service at the state and local levels. He spearheaded the Coalition for Fire-Safe Cigarettes, which became the vehicle for approving fire-safe cigarette legislation at the state level. Within three years of the Coalition's formation in 2006, all 50 states had approved fire-safe cigarette legislation, leading to significant reductions in the number of cigarette-related deaths. "Jim Shannon has been a strong leader for our nation's fire and emergency services on so many issues," said CFSI President William F. Jenaway. "Through his efforts and actions - including testifying before Congress, committing NFPA's resources and staff expertise to many national efforts and federal initiatives, and publicly advocating for important public safety initiatives such as fire-safe cigarettes and fire sprinklers - communities across our nation have benefited." For more information and support, check out www.firefightercancersupport.org . What has made this eye-catching vehicle so popular is its contents; half of the compartmentalized trailer is used for live burn and sprinkler demonstrations while the other half is filled with educational materials. For instance, in the educational compartment, there's a freestanding, 300-gallon tank and pump that's in accordance with NFPA 13D: Installation of Sprinkler Systems in One- and Two-Family Dwellings and Manufactured Homes, and looping videos of NFPA's Faces of Fire, a component of NFPA's Fire Sprinkler Initiative that underscores personal stories of those impacted by home fires. For more information on the trailer, visit NFPA's Fire Sprinkler Initiative blog.